Slug or single pack -Normal pack and popular with 100 gms and 150 gm s of biscuit for a single day stock for an individual.popular with School or College going kids . Assorted pack-These mostly offered during festival or with some sales promotion it consists of different varieties biscuit in one pack from a single manufacturer. 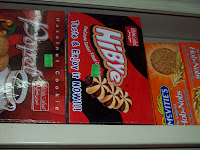 Tray pack-Biscuit are placed in trays and then packed with wrappers . Biscuits flavour most in demand?